Taylor Guitars is one of the world-class leaders in the guitar manufacturing industry, and today we’re going to pit their GS mini versus the Taylor 114. Both of these acoustic guitars are phenomenal (given that both models are “boutique” level acoustic guitars), but there are some differences that make them ideal for comparison. That being said, if you’re looking for a quality acoustic guitar, you’re on the perfect place. The Taylor 114 was introduced to the market in 2013, and it’s no wonder people are still buying it despite the fact that it’s a 5-year old model. It features layered back & sides which provide a huge bonus to resilience, making it one of the most durable acoustic guitars ever made. The shape of this guitar is described as “Grand Auditorium”, with the body length measuring 20 inches, body width measuring 16 inches, and body depth measuring 4,625 inches. This particular body shape was invented and made famous by Bob Taylor (the founder of Taylor guitars), and it is one of the most popular body styles these guys are using. The top of 114 is made of Solid Sitka spruce, which provides a versatile dynamic range while the layered Sapele body provides an excellent outlook and durability. As for the other features, there’s the tortoise pickguard, a set of die-cast chromate tuners, a set of “Elixir Light” strings, twenty medium frets, and NuBone™ nut and saddle. Just for the sake of comparison with GS mini, we’ll note that Taylor 114 doesn’t feature any electronics (whereas GS Mini does). In essence, GS Mini is a scaled-down “Grand Symphony” acoustic guitar. It features a smaller size, making it more compact, easier to carry and handle for that matter. Surprisingly enough, the GS mini provides a rich tone despite its smaller size. The body width of GS mini is 14 3/8 inches, body depth is measured at 4 7/16 inches, and body length measures 17 5/8 inches. Though smaller than most convenient acoustic guitars, this guitar is not “petite” per se. Both the top and body are made of the exact same materials as Taylor 114 – the top is made of Solid Sitka Spruce while body features Layered Sapele materials. The only difference regarding the major features between Taylor 114 and GS mini is that the latter comes outfitted with ES-Go electronics, making it a bit more versatile and suitable for nearly all music styles. Just like Taylor’s 114, the GS Mini features twenty frets, Tortoise pickguard, and a set of die-cast chromate tuners. The strings outfitted to this guitar are Elixir’s Phosphor Bronze Medium (as opposed to 114’s Elixir Light). This guitar also features the Nubone Nut and Micarta Saddle. Since both Taylor’s 114 and GS Mini are made of the same materials, the tonewoods don’t play a vital role in determining how they sound when compared. The truth is, both of these guitars provide a rich, pristine clear sound that can easily outshine that of most boutique level acoustic guitars. In fact, GS Mini features a scaled-down body type, so one might think that it sounds a bit less punchy – that, however, is nowhere near the truth. This round is, hence, a close one. Taylor’s 114 is outfitted with Elixir Light strings while GS Mini comes with Elixir Bronze Medium strings – it’s a thing of preference actually, although the difference in sound can be felt and heard quite easily. What we can conclude, though, is that Taylor’s 114 doesn’t feature any electronics, whereas Taylor GS Mini does – unplugged, these guitars sound pretty much alike, but once amped, the GS Mini has the upper hand, and wins the round. As we’ve mentioned earlier, both Taylor 114 and GS Mini are made of the same materials – the Sitka Spruce back and sides and layered Sapele body are what adorn these remarkable guitars. That basically means that they’re equally durable and well-built. Their design, on the other hand, is what matters here. The “Grand Auditorium” style of Taylor’s 114 is pretty close to being perfect, but the scaled-down GS Mini isn’t lacking either. In fact, it’s the GS Mini that’s a bit more playable and versatile, not to mention easier to handle and use due to the smaller body. That means that GS Mini wins another round. While the differences between Taylor’s 114 and GS Mini are quite minor from what we’ve seen so far, the difference in price between these two exceptional guitars is all but. 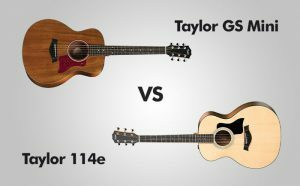 Namely, Taylor’s 114 is more expensive than GS Mini, and even though both of these models boast a remarkable value for the cash, GS Mini conclusively wins the last round in this bout. Let’s discuss the pricing of these acoustic guitars in more detail. The less expensive GS Mini belongs to the lower bracket of the “expensive” price point category, and if we’re to label it as “expensive”, we would be neither right or wrong. Surely enough, it’s expensive for a casual guitar player but professionals would deem it as “slightly above cheap”. On the other hand, the Taylor 114 costs nearly twice as much – it can be found in the medium bracket of the “expensive price point category”. Truth be told, if you’re looking for a pristine clear, normal-scale acoustic guitar, your best bet would be to go with the 114, but GS Mini has a set of electronics onboard while the majority of major features of these guitars are identical. It appears that Taylor’s GS Mini won all three rounds conclusively – even though it doesn’t sound “better” than the Taylor 114, it won the “sound” round due to the premium-quality it comes outfitted with (which 114 lacks). It’s smaller, hence more compact than 114, and it doesn’t cost as much. Though one-sided, Taylor’s GS Mini is just slightly better than Taylor 114.